Question – Indian Common Crow is also called “Euploea core core”, and it is not a crow. Can you guess what it is? 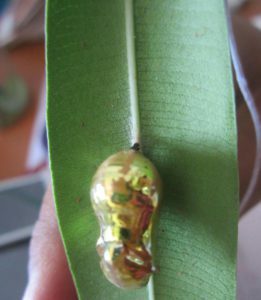 On Wednesday, August 17, 2017, a child of Class III C quietly kept on my table a Champa leaf with beautiful greenish golden pupa attached to it. When I asked the children, “who brought it?” no one answered. Perhaps they were afraid I would scold them. We kept the pupa in a transparent jar for observation. The whole class was excited and asking, what is inside the pupa? Children were curiously but cautiously trying to feed the pupa food items like dates, rice and snacks. There were funny and healthy arguments among them. It was so cute to watch them making up stories about the pupa. Some imagined that it was walking. Others said the pupa has a pair of eyes. 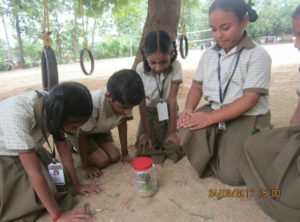 A few of them insisted they saw a butterfly flying inside the pupa. During the time that we had the pupa students did not want any weekend holiday. That Friday I took the jar home with me and watched it carefully. On Monday with so much energy children wanted to know what happened to the greenish golden creature? All of the 29 children in the class were recording their observations. Most of them were trying to watch carefully and put exact observations into their recordings. 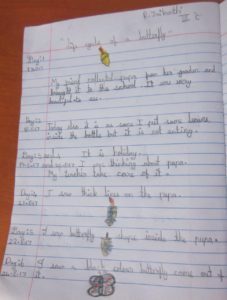 Tots were happy to observe the change in colour on the greenish golden pupa, which turned partially blackish on Monday. On the next day we were able to see X-ray lines on the pupa which exactly resembled the wings of a butterfly. Some wonderful changes were happening inside the pupa. It was really a hectic job for me to save the jar from the busy bees who were restless and impatient to get close towards the it. Just to calm them and to recall the stages of a butterfly I got them to watch two short videos, “My green world”, and “Caterpillar shoes” – the second one was a fantasy animation. Finally, exactly a week from the day the that we found the pupa, it magically transformed. 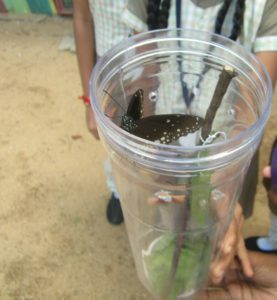 The children saw a beautiful black spotted butterfly come out of the jar, ready to explore nature. Children were delighted to see it flying. It was a butterfly called the Indian Common Crow. 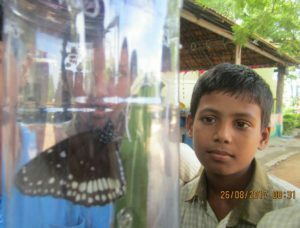 Click on the “Early stages” tab in the following link to find some images of its caterpillars, pupas and butterflies.